Two points of steel-on-steel friction work to prevent and correct trailer sway in this weight distribution system. 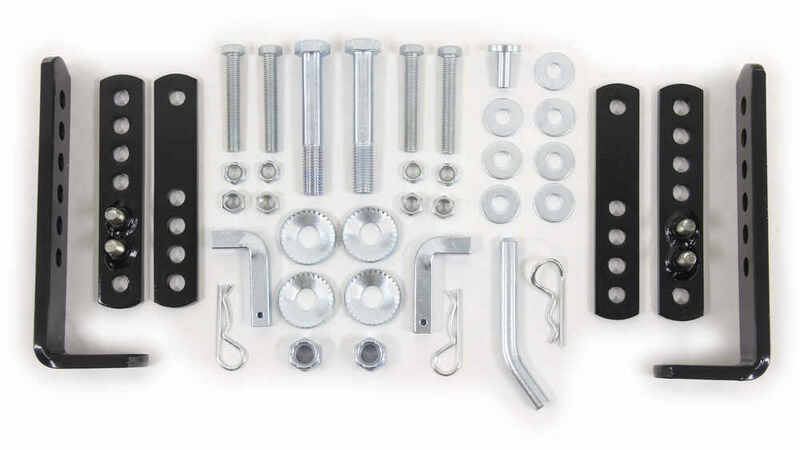 Sway control brackets help to ensure that your trailer stays in line with your tow vehicle. Shank and 2-5/16" hitch ball included. 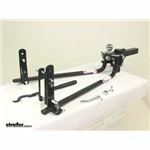 Lowest Prices for the best weight distribution from Fastway. 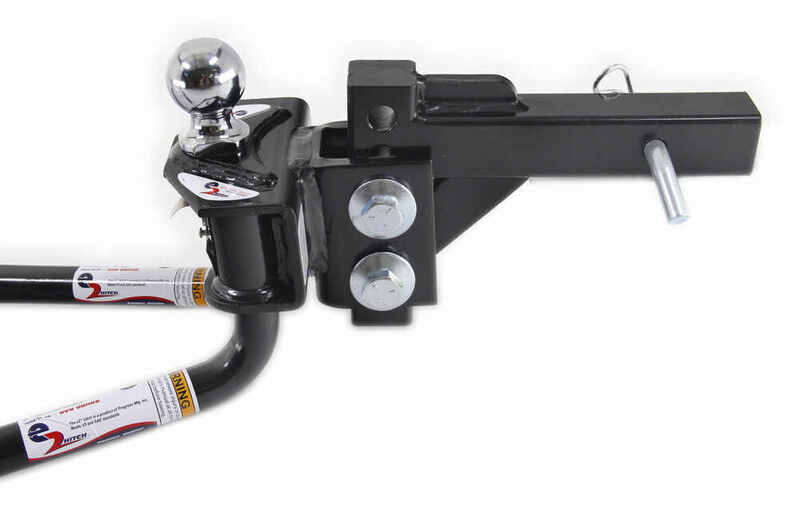 Fastway e2 Weight Distribution w/ 2-Point Sway Control - Round - 2-5/16" Hitch Ball - 10K GTW part number FA94-00-1061 can be ordered online at etrailer.com or call 800-298-8924 for expert service. The two points of sway control within the e2 are created by the steel-on-steel friction that occurs when the spring bars slide within the L-brackets that are mounted on the trailer tongue. Most traditional weight distribution systems have spring bars that are suspended by chains. Although this ensures that the system is not so rigid as to create bounce in the trailer, it also allows a good deal of side-to-side play in the system. The direct friction that is applied to the spring bars in the e2 system helps to stop sway once it has begun. The concept is similar to the way in which an add-on friction sway control device functions. When each spring bar moves forward or backward, or side to side, it rubs along the bracket, creating friction. The resistance created by this action limits the movement of the spring bar, thus preventing further side-to-side movement of the trailer. Most add-on units feature some sort of friction material similar to that used in automotive brakes. But the e2 uses direct steel-on-steel contact to create resistance. This is the same sort of friction that is used with locomotives that pull loaded railcars weighing tons. No additional materials are needed. The steel will outlast any of those other materials, providing an extremely durable, functional sway-control system. Today we're going to be taking a look at the FastWay e2 Weight Distribution System with 2-point Sway Control. This is going to evenly distribute weight over the axles of your towed vehicle and trailer. It's going to offer better stability and better control. 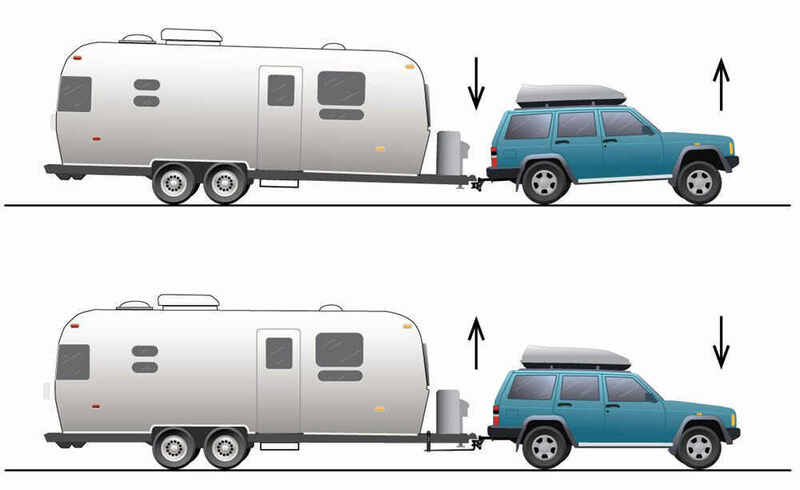 Ultimately it's going to create a more level ride for both the towed vehicle and your trailer. Now this particular unit is going to feature two points of integrated or built-in sway control to limit side to side movement of your trailer. These brackets are designed to keep your spring bars in place for a rigid system that holds the trailer in line at all times. As you can see it does not use lift chains like other weight distribution systems. That means that the spring bars can not move freely. It's going to create steel on steel friction. That's going to help minimize sway caused by winds, curvy roads or sudden maneuvers. Now the unique design of the system makes it compatible with surge type brake actuators. 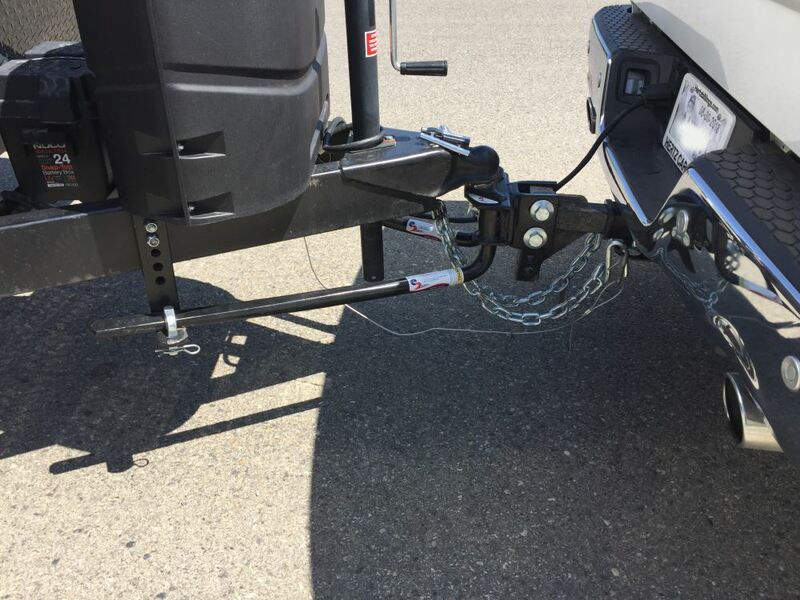 You can even back up your trailer without disengaging the hitch. These are going to be round spring bars that flex appropriately over uneven terrain, offering a nice, controlled, even ride without the bounce. These are going to be no-drill, clamp-on brackets that are adjustable. They can be adjustable on the trailer frame to accommodate frame mounted items, such as gas tanks, battery boxes, tool boxes, or generators. This unit can be used with top mount and bottom mount trailer couplers. When it comes to getting the tilt out of your head assembly, desired tilt is achieved with a traditional washer design. It's going to come with a spacer rivet, and it's going to come with all your washers. Spacer rivet installs between the back of the head assembly and the adjustable portion of the shank. There's going to be a slot right in here for that to be installed. That way you can easily add or remove washers from the spacer rivet to tilt the head up or down. It's also going to include an angle set bolt that you can tighten once you have that angle set or the tilt set. You can tighten that to make contract with the face here of the shank. Now it does come with detailed installation instructions, as well as an owners manual that's going to walk you through your initial setup, showing you how to get the unit adjusted for your application. The unit's constructed of a steel construction. That's all going to be powder-coated, so it's very strong and durable and it's going to be highly resistant to rust and corrosion. It's going to look great for a long time. 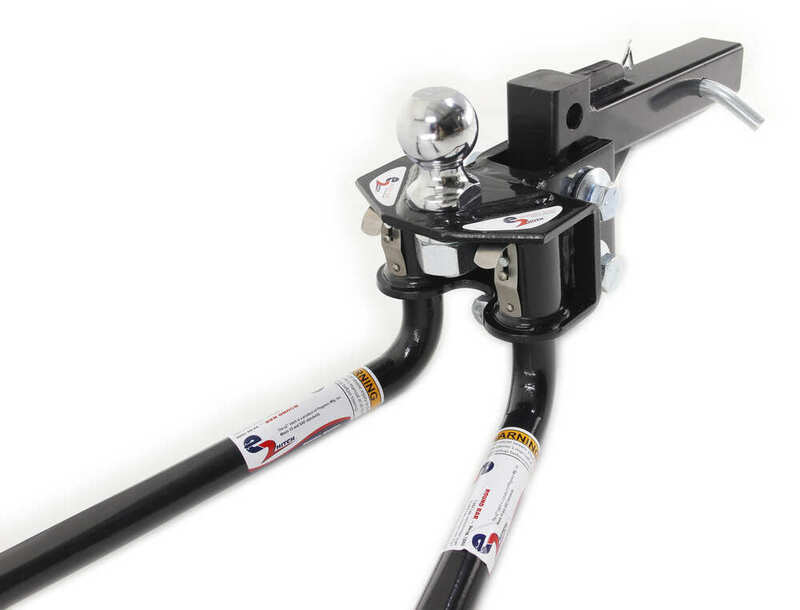 It's also going with a snap-up lever that eases the installation by reducing the amount of lifting required by the trailer jacks. These just help get the bars in place. Sometimes there's tension on those, so you want to be careful to stay a safe distance away when engaging or disengaging the system. That lever just makes that process much easier. The head assembly does come with a hitch ball, so your hitch ball is included. It's going to come with a two and five sixteenth inch hitch ball. It's already pre-installed. When it comes to the maximum tongue weight for this system, we're looking at one thousand pounds. Now always keep in mind that proper tongue weight is going to help generate the friction needed for the unit to do even a better job at reducing trailer sway. When it comes to the maximum gross towing weight capacity, we're looking at ten thousand pounds. 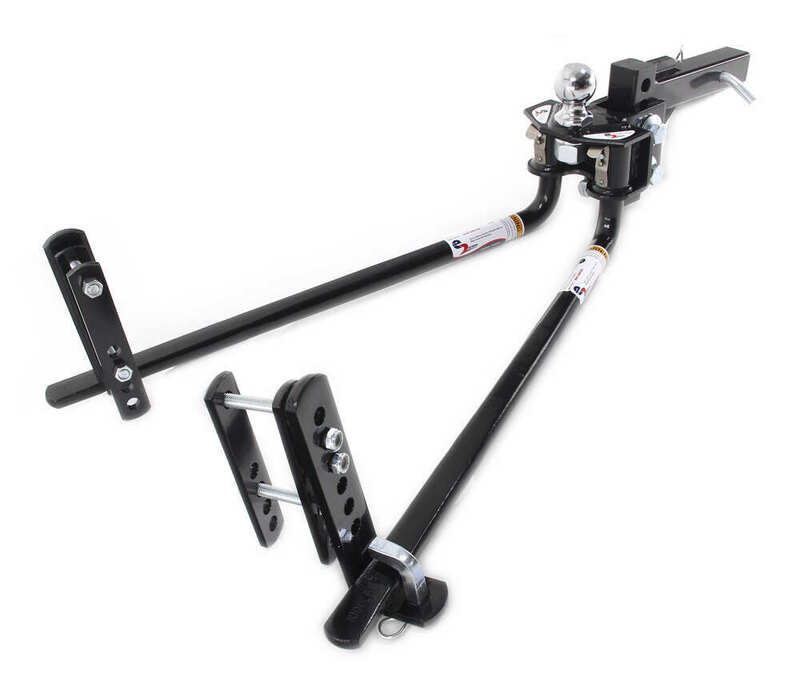 The unit's designed for two inch by two inch trailer hitch receivers rated for use with the weight distribution system. When positioning your sway control brackets, these are going to be positioned twenty-four inches to twenty-seven inches back from the center of your coupler. The shank is included with the system as well. This can be used in the rise and drop position. It's going to offer six adjustment holes. Those holes are separated on center by inch and a quarter. I did take a measurement from the center of the hitch pin hole to the center of the hitch ball. That's going to measure around twelve and three quarters of an inch. I also took a measurement with the shank in the rise position, and the head assembly at the highest setting, and got a maximum rise measurement of around six inches, measuring from the inside top edge of the receiver tube of your hitch, to the top of the ball platform. I did that measurement in the drop position as well, with the head assembly at the lowest setting. This system gave us a maximum drop of two inches. The unit is also covered with a ten year warranty. One of the other things I wanted to mention real quick is how the bars disengage from the head assembly. It's going to have these spring clips right here. When you're wanting to disengage, obviously you would need to remove the bars from the brackets. That's just held in there with an L pin, but then also here at the head assembly it's got this clip that you can pull out. Once you pull that out, the bar will disengage from the head assembly. If you don't want to do that, you can actually take the bar, rotate it all the way back until it disengages from the head assembly as well. Disengaging and engaging the arms is a pretty quick and simple process with this weight distribution system. That's going to do it for today's look at the FastWay e-2 Weight Distribution with the 2-Point Sway Control. It's also going to come with your five-eighth inch diameter hitch pin and clip to get the unit secured inside the trailer hitch receiver on your vehicle. Order: RelevanceNewestRating - High to LowRating - Low to High Two points of steel-on-steel friction work to prevent and correct trailer sway in this weight distribution system. 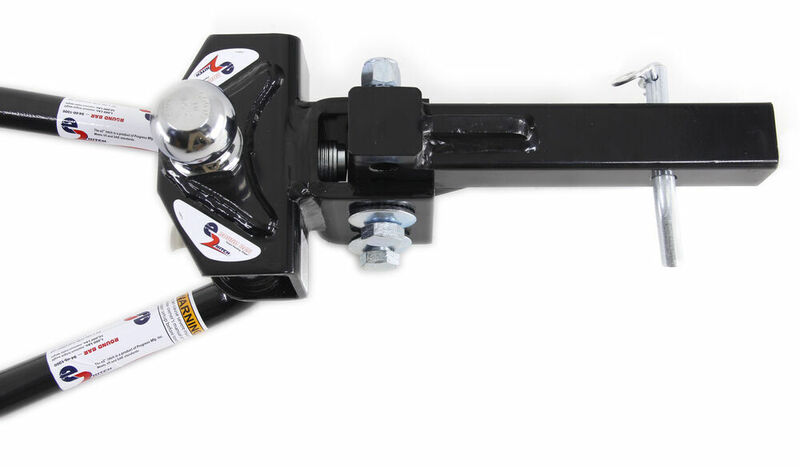 Sway control brackets help to ensure that your trailer stays in line with your tow vehicle. Shank and 2-5/16" hitch ball included. Over 6600 miles on this hitch, and not a problem! We have driven from Michigan to Niagara Falls, Florida, and countless places closer to home. I have hooked/unhooked this hitch 50+ times and it is extremely quick and easy. I am still highly satisfied with this hitch and recommend it to everybody I know who is getting started. Great, took a little time to get the right combination. I’m pulling a 20 foot PJ car hauler 10,000 lb hauling antique tractors around 5,000 lbs. When I pull the trailer empty I take the torsion bars off it improves the ride. Still working great after a year and many miles. The washers act as a fine adjustment for the tilt of the weight distribution head. The more washers added to the stud, the further rearward the head tilts. If you use the provided link, you can see an install/set-up video that will walk you through the process. The noise you hear is caused by the metal-on-metal friction caused by the downward force applied to the frame brackets by the spring bars. This friction is what provides the sway control. As you mentioned, lubricating the contact points would completely defeat the sway control feature. Unfortunately, the noise is just the nature of the beast with this type of product. The difference between the 800 lb tongue weight E2 Fastway Weight Distribution System part # FA94-00-0800 and the 1,000 lb tongue weight version part # FA94-00-1061 is the amount of spring bar tension either is rated for. 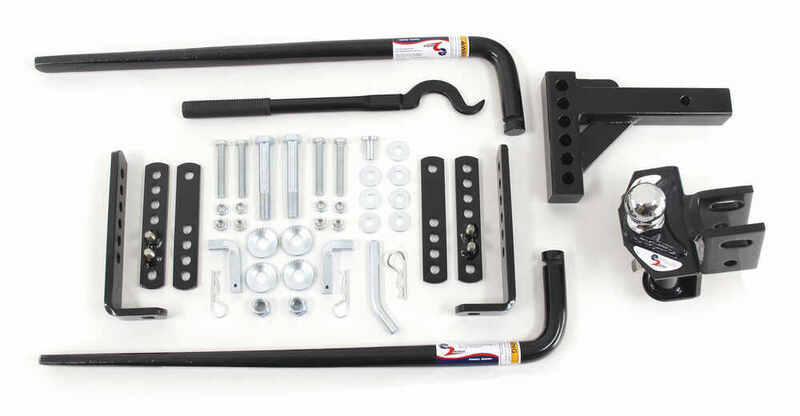 The 1,000 lb kit has stiffer spring bars so that it can handle higher tongue weight capacities and the 800 lb kit has spring bars that aren't quite as stiff. How Do I Know What Drop Is Needed For My Lifted Ford F-250 With Bigger Tires? Yes, the Fastway e2 Weight Distribution w/ 2-Point Sway Control # FA94-00-1061 that you referenced comes with a hitch ball installed on the head of the system already and it is torqued and ready to go. The flanges on the head that attach to the shank on Fastway weight distribution system # FA94-00-1061 will flex some but may not completely "pinch" the shank. But the shank bolts only get tightened to 250 foot pounds each, not 400. The torque to attach the ball to the head is 450 pounds. I can't see a toque spec anywhere that states 400 pounds for this system. You have what is called a bottom mount or underslung coupler. The Fastway weight distribution system # FA94-00-1061 will work with this type of coupler. You will just need to install the link plates (that go on the trailer frame) upside down. There are steps on how to do this in the instructions which I have linked for you. I have also linked a video review for you. 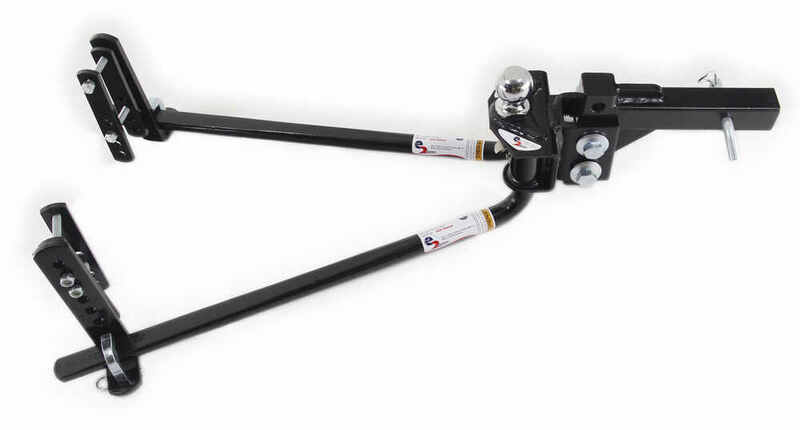 Yes, the shank of the Fastway e2 Weight Distribution System # FA94-00-1061 can be used either direction for rise or drop. The replacement shank is part # FA92-02-4100. You can use Replacement Snap-Up Lever # FA92-00-6000 for your Fastway e2 Weight Distribution System # FA94-00-1061. For reference I also linked our page for all replacement parts for their weight distribution systems.